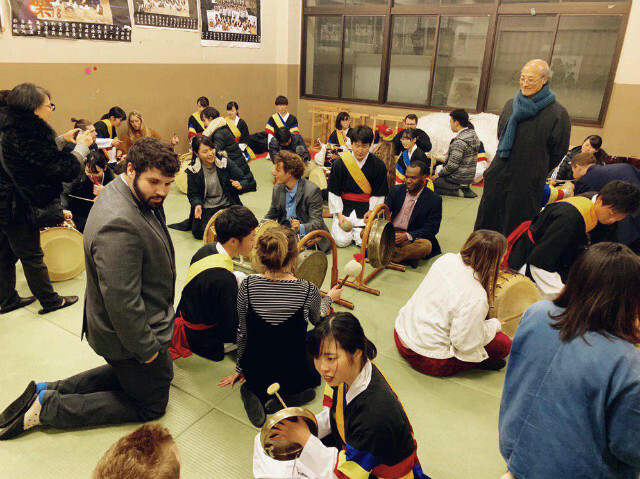 DePauw students on winter term are the first-ever group of U.S. students to visit the schools and institutions of Chongryon between Jan.14 and Jan.20, 2019), the General Association of Korean Residents in Japan. According to 21st Centry Media on Jan.21, 2019). The following writings are done by DePauw University students who participated in the Int’l Student Exchange Program (ISEP) which was organized by the Washington-based Institute for 21st Century Int’l Relations, working with DePauw University in Indiana and Korea University in Tokyo. 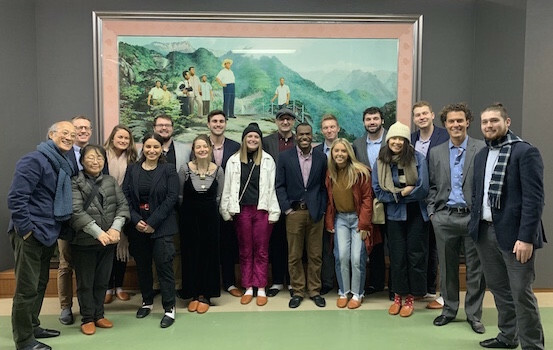 DePauw students on winter term are the first-ever group of U.S. students to visit the schools and institutions of Chongryon, the General Association of Korean Residents in Japan. About 700,000 ethnic Koreans live in Japan, descendants of Koreans who settled there during Japan’s rule of Korea before World War II; as conscripted laborers during the war; and as post-war refugees. Having learned “an immense amount” of Korean history, “we are now better able to understand the continued struggle Koreans suffer in Japan,” says Jalen Friendly ’20. “Through dialogue with both students and faculty, we came to understand why such pride exists in Korean culture. Having to continually fight for their freedom, Koreans explained to us why they felt it was so important to open Korean schools in Japan. Though they were far away from home, their culture was never to be lost. During our trip to Japan, the class had the incredible opportunity to visit Chongryon, Korea University, historical landmarks and memorials of Koreans in Japan as well as the beautiful city of Tokyo. Each day of our trip professors from the University guided us throughout the day along with students from the university. Although the majority of the information was provided by the professors and guides at each specific location, the students who sat next to us on the bus, walked next to us during tours, and ate meal with us had the greatest impact on myself. Spending a week with a group of students who embody the Juche philosophy was truly an eye opening experience for myself and many member of the class. During the entirety of our trip we were welcomed as comrades and fed like kings. The students took time from their busy days to spend it with us as well as engage in meaningful conversation were we began to realize their struggle, but more than their struggle their passion for change and for the reunification of the Korean peninsula. Throughout my week in Japan, my group and I were treated with nothing but kindness and love. As we bonded with Korea University students, we formed friendships that none of us will ever forget. Everything we did throughout the week had so much meaning and really made me appreciate the preciousness of the history of Koreans in Japan. It amazed me every single day to see the love and happiness shared among everyone in the Chongryon community. For a group of people so relentlessly discriminated against, I experienced an inspiring amount of hope and positivity. The tour itself was both educational and fun, and was led by amazing professors who showed so much passion for what they were teaching us. In particular, I was moved by the emotion, respect, and solidarity shown at the shrine to Korean forced laborers. To learn about the struggle is one thing, but to live it and be able to feel it is something I will cherish forever. I am so grateful for every moment I spent on this trip and I will continue to cherish each and every person I got to spend it with. The experience I had in visiting Japan was that of a lifetime. We visited Chongryon which is a sector inside of Japan that contains a Korean population. Korea University is located within this sector, and the students that makeup the student body were nothing but remarkable. Immersing ourselves into their culture brought out values and emotions in each and every DePauw student that attended the trip. Their culture holds kindness, love, and friendship that is embedded deep into their roots and shines in beautiful ways when illustrated. Korean cultural habits were put on full display when I was able to spend time with them and develop a curiosity for their demonstrations. The giving nature shown around the dinner table, the affection shown when simple communication is occuring, and respect to each and every peer around them are just a sliver of beautiful traditions they are accustomed to. The people of Korea set a standard that I now hold myself to and wish to carry out their traditions within my own life. This trip was fundamentally life changing. Before coming to Japan I was just a college student with a passion for education. Being back in the states, I am now a student with a life-long goal; to aid the reunification of Korea and to spread the truth about imperialism all over the world. Coming from the United States we rarely have to reflect on the brutality of our nation’s history; rather, we simply benefit from being a global superpower. 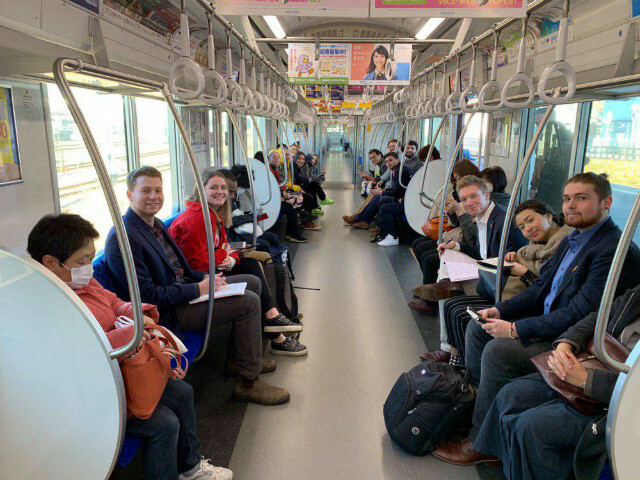 Being in Japan allowed me to see a side of reality that I never knew existed, because it is the side of reality that the US and Japan have aggressively tried to conceal. Meeting with Korea University students taught me that there are students just like me, who suffer everyday because of the actions of my nation. Growing up, I was taught very vague information about North Korea, I was never sure exactly why I had the ideas that I had about North Korea, I just knew that I wasn’t supposed to like North Koreans because they could be some type of a threat. Meeting with Korea University students I had the opportunity to unlearn all of the negative stereotypes that I was taught about Koreans, and ended up making lasting friendships. During the tour I felt an assortment of emotions, some would include: happiness, sadness, and anger. The Koreans we met and bonded with brought me happiness through their open arms and warm welcomes. I felt sadness because we met some truly great people stuck in a horrible situation and I felt anger because I felt as if I could not do anything to help the Koreans with their situation. My range of emotions fluctuated throughout the trip; from visiting multiple Korean schools and never seeing a sad face, despite their situation—which made me happy. One very impactful place we stopped on the trip were the tunnels carved out by Korean slaves in 1944 for the Japanese government; the stories of abuse and mistreatment towards the Koreans soon came to life. Peoples stories and words from books soon came to life in that tunnel system, even though the tunnel was built on the sacrifice of the Korean people. I will be forever grateful for the Korean students and professors that brought us in without question and treated us with the utmost respect. We spent a week with students from Korea University. Each day we went on historical and educational tours and had meetings that helped us to understand the current situation of Koreans in Japan. We visited a middle/elementary school, high school, and the university and with each student that I met and class that I stepped into, I began to understand the struggle and the motivation that Koreans have to continue fighting for justice and reunification. I saw a community of people of all ages working together to sustain and promote Korean culture. I saw that the discrimination by the Japanese government hinders them from flourishing in ways that they are capable of, but the resilient hearts in the community see right past the discrimination. I felt extremely welcomed into the Chongryon community. I felt empathy toward students who were discriminated against and I felt impassioned to change the negative perception that Americans have of North Koreans. I feel extremely grateful to have been exposed to such a unique and passionate group of individuals, and I feel hopeful that they will soon achieve their goals. I was incredibly humbled and in awe of the love and warm welcomes from the university students upon arriving at Korea University in Tokyo. It didn’t take long for us to develop genuine relationships and be able to open up to each other about our own personal life experiences and unique perspectives. Kiyul Chung was an instrumental part of the trip. He was incredibly informative, charismatic, and continued to contribute positive energy throughout the week. Dr. Chung will forever be a person I will look up to and continue to stay connected with throughout my life. I was able to become closer to Dr. Chung through the personal narratives he shared with me throughout the week. I am inspired by his ability to carry himself with grace having experienced many hardships and painful trials and tribulations throughout his life. One of the most memorable moments of the trip was sitting still in the cool darkness of the tunnels built by Korean slave laborers. I was moved and touched in that moment. It was hard to believe that people were forced to create such vast tunnels in the uncomfortable darkness. The struggle that Koreans continue to face in Japan today is a lonely struggle. The peaceful protest that meets weekly is a testament to their commitment to keep their Korean culture and heritage. I was deeply inspired by the trip to take the narratives and stories I had learned throughout the week back home. There is nothing more powerful than personal narratives. They so easily can reveal the truth about what we often may not know about others. Growing up in the United States we are often told only bits and pieces of a story, which can be troubling. This experience for me was in many ways life changing. It allowed me to understand new perspectives on U.S. and Korea relations, and the current struggle that exists among Koreans in Japan. My experience with the students of Korea University was life changing. I would have never expected to be treated with such kindness and respect by people I had never met before. While many new friendships were formed, much more learning took place. Having never spoken to a Korean before, I now have a much better sense of the daily struggle Koreans face. North Koreans are clearly distorted in the media as this ill-tempered group led by an angry dictator. This trip made me realize that all Koreans want is to be able to peacefully celebrate their own culture without being discriminated against. Visiting both the Yokosuka tunnels and Kanto Massacre memorial made me realize the level of discrimination Koreans have faced in Japan. 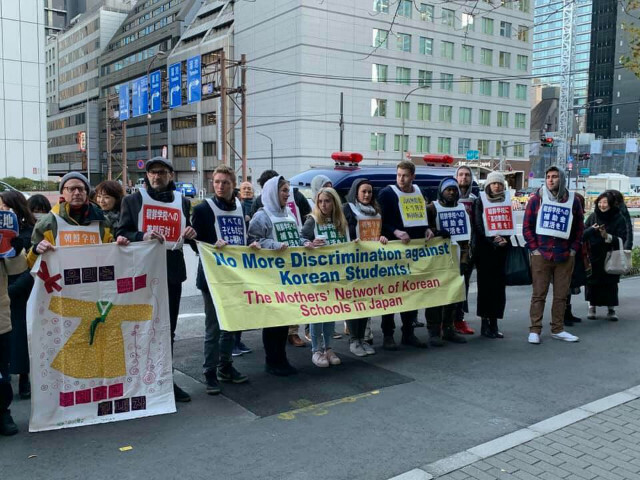 The protest for Chongryon schools brought light to the fact that discrimination is on-going, for the Japanese government refuses to fund Korean schools. Through this all, Koreans have not lost a sense of who they are. I applaud the students at Korea University for wanting to keep their cultural traditions alive, while showing me that all humans really are the same. Though we may all be from different ethnic backgrounds, we share much more in common than one can ever imagine. Getting to tour Korea University was something I never thought I would be able to do. The pride and kindness of the students was immediately shown the minute we stepped off our bus each time we arrived on campus. Students eagerly ready to converse in a language that was not of their first nature. We were able to see the natural and historical museums within the school that gave us a sense of what Korea is like. The array of plants, rocks, and animals allowed me to understand the vegetation and life blooming in this land. I was so grateful to be able to tour something so sacred to the students and faculty. Not once did I ever feel unwelcomed walking through the campus, eating at the dining hall, or sitting in watching a class. I was able to see how much these students on this campus respected one another as they all looked toward the bigger picture. Reunification. Each classroom is simple with natural colored walls and a picture of Kim Jong-un and Kim Jong-il hung in the front of the classroom above the blackboards. The lunchroom stretches wide with tables intertwined with male and female students. Some of my favorite interactions sitting at lunch getting to eat authentic Korean dishes sitting with my new Korean friends. Genuine conversations about our lives and what we aspire to do with them. The overall love, generosity, and guidance given to us was something I will truly cherish and take back with me in the states. Not only this, but the overall respect and knowledge shared within this school was motivating and will impact me to keep looking toward the bigger picture with them. Coming into the trip I really did not know what to expect. The only previous knowledge I had about the Korean culture and history was from our studies, the few days prior to the trip. All of this information was very new to me I had not even known that the Koreans in Japan were being discriminated against. This is what made going into and being able to experience a culture that has kept, despite the adversities faced on its way. Studying the history of Koreans and how they originally got to Japan through Slave labor, was something not of common knowledge. Being able to really see the history and how hard these people have fought to keep their culture alive is very inspirational. When with the Korean students you could feel a real sense of community you could get no where else. I asked one girl how many people go to her school she answered, 600 and I know all of their names. This to me shows their commitment to community. Seeing how many people showed up to support their band club at the school was something that would be unheard of here, at Depauw. It was clear to see how hard the people who had attended Korea university worked to make it what it is today. The students have had to help build the buildings in the past, and they did this willingly to help maintain the culture. Over all I gained a new respect for a group of people who have fought through adversity to continue their culture, and this has lead them to a strong close knit community. I very much appreciate all of what the people of Korea University and Chongryon did for us. This tour gave me an opportunity to completely reconstruct how I understood the experience of Koreans in Japan. Before this opportunity I had only understood Japanese colonialism from a U.S. centered perspective, disconnected from and disinterested in the details. The limitations and inadequacy of my understanding I developed through the U.S. Education system and publicity was illuminated when I met the Korean people in Japan for myself. Everything from the small, everyday conversations with students to the trips to historic locations of struggle were impactful and meaningful experiences that I treasure. I am inspired and left speechless by the determination, resilience, and persistence of the Korean people living in Japan, and the oppression they have struggled against. In the end, this trip was more than just a study tour, this trip was a profound experience that gave me a chance to see the world from a different perspective. I cannot express how grateful I am to the people of Chongryon and the students and professors of Korea University, for allowing us to enter their home and displaying the beauty of their culture, the hardship of their struggle to survive, and their willingness to welcome and show love to complete strangers.